Description: Black large cylinder (measures 2-1/2" long, 2" diameter). One end of the cylinder is closed with a molded recessed plus (+) shape and a hole in the center. The other end is open with a jagged edge. 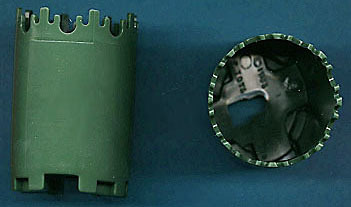 Description: Green (military green) large cylinder (measures 2-1/2" long, 2" diameter). One end of the cylinder is closed with a molded recessed plus (+) shape and a hole in the center. The other end is open with a jagged edge. Description: Red large cylinder (measures 2-1/2" long, 2" diameter). 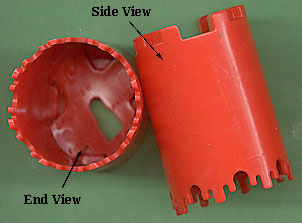 One end of the cylinder is closed with a molded recessed plus (+) shape and a hole in the center. The other end is open with a jagged edge. Description: Silver tiny cylinder (Measures 1/2" long, 3/8" diameter). The cylinder is hollow inside. Description: White large cylinder (measures 2-1/2" long, 2" diameter). One end of the cylinder is closed with a molded recessed plus (+) shape and a hole in the center. The other end is open with a jagged edge. The sides of the cylinder may have one or more paper lithos...either dark blue, white, and light blue striped, or white with black "CX580" writing, colored squares or rectangles, or dots. Description: White Glow-In-The-Dark tiny cylinder (Measures 1/2" long, 3/8" diameter). The cylinder is hollow inside. Description: Tiny yellow cylinders (Measures 1/2" long, 3/8" diameter). The cylinder is hollow inside.